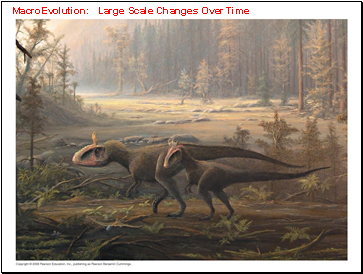 Past organisms were very different from those now alive. 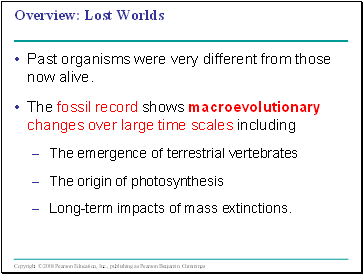 Long-term impacts of mass extinctions. 1. 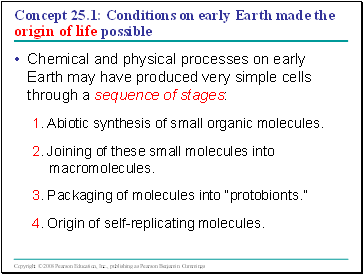 Abiotic synthesis of small organic molecules. 2. Joining of these small molecules into macromolecules. 4. Origin of self-replicating molecules. Earth formed about 4.6 billion years ago, along with the rest of the solar system. Earth’s early atmosphere likely contained water vapor and chemicals released by volcanic eruptions (nitrogen, nitrogen oxides, carbon dioxide, methane, ammonia, hydrogen, hydrogen sulfide). A. I. Oparin and J. B. S. Haldane hypothesized that the early atmosphere was a reducing environment. 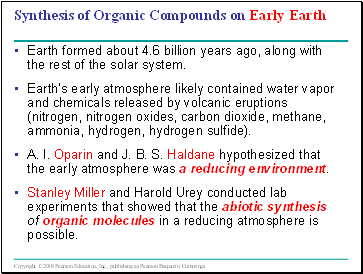 Stanley Miller and Harold Urey conducted lab experiments that showed that the abiotic synthesis of organic molecules in a reducing atmosphere is possible. However, the evidence is not yet convincing that the early atmosphere was in fact reducing. 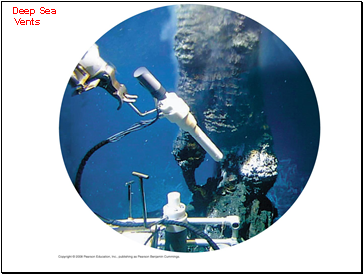 Instead of forming in the atmosphere, the first organic compounds may have been synthesized near submerged volcanoes and deep-sea vents. 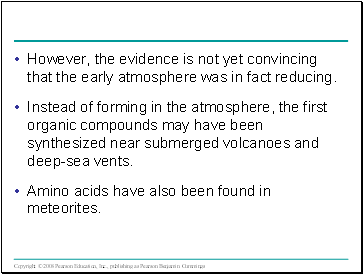 Amino acids have also been found in meteorites. 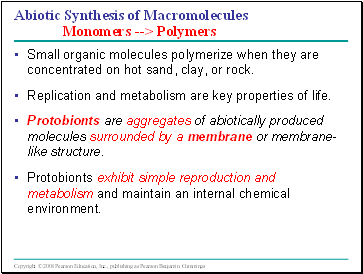 Small organic molecules polymerize when they are concentrated on hot sand, clay, or rock. Replication and metabolism are key properties of life. Protobionts are aggregates of abiotically produced molecules surrounded by a membrane or membrane-like structure. Protobionts exhibit simple reproduction and metabolism and maintain an internal chemical environment. 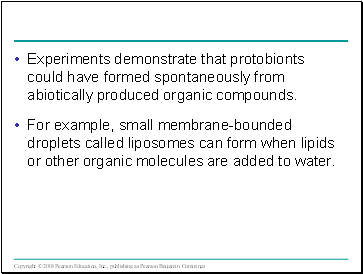 Experiments demonstrate that protobionts could have formed spontaneously from abiotically produced organic compounds.